Welcome to the Imaginatorium Shop, now in our sixteenth year! From our base in Japan (here! 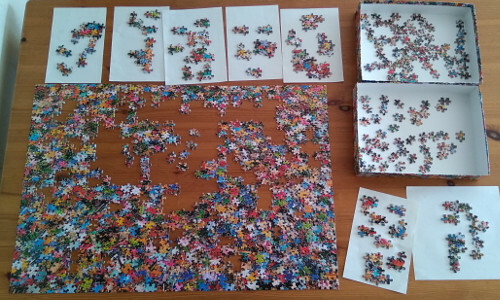 ), we send jigsaw puzzles anywhere in the world. Most of the hundreds of puzzles we have in stock feature oriental themes, but the high quality of Japanese-made puzzles (exquisite printing, really solid card stock, and clean cutting) also makes "reverse imports" highly desirable — puzzles of Peanuts, Disney, and lots of other Western characters popular in Japan. 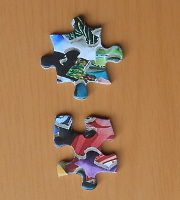 In general, if a puzzle is available in Japan, we can get it for you within a week or so - see the special orders page. 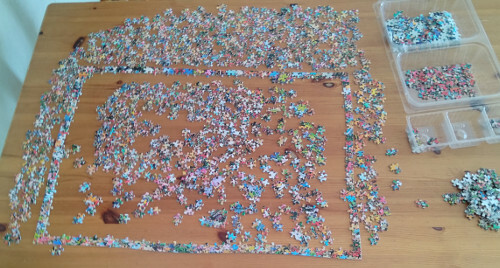 Missing pieces - help when you have the puzzle but can't find a piece! Exotic locations from around the world! There is an interesting range from Beverly of "Puzzler's puzzles," just chosen to be different or difficult. 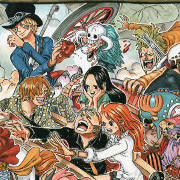 The latest they have called "Jigsomania" (the way "Jigsaw" is written in Japanese looks like ji-gu-so-o, hence the 'o'), consisting simply of a photograph of a pile of jigsaw puzzle pieces. I did the 1000-piece version; there is also a 300-piece. I don't normally look at the box ("cheating"!) and I don't normally start with the edge pieces, as I enjoy watching the picture emerge from chaos. But here it is all but impossible to sort the pieces by basic area - the sky pieces, the grass, the boat, and so on - so I settled on the edge pieces first. This didn't actually take too long, but then the real struggle begins. 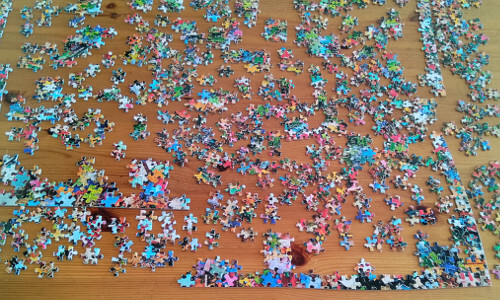 I would go through the pieces, choosing some distinctive colour, and just try to find any pair of pieces that fitted together. Ever so gradually, bits got joined together; but unlike a normal puzzle, where there are always coherent areas of the same texture, here the pieces just joined in random squiggly clusters. Although I ended up with several large "lumps", connected pieces with no connection to the edges, curiously the corners definitely filled in first. I'll leave the explanation of this to the "spoiler" box below. To give you some idea of the difficulty, there's a close-up of some of the pieces on the right. I have taken out two pieces from the middle and separated them... just look at the match! If you have the lower piece, you will be looking for a piece with light blue on the left and pink on the right, which are barely visible on the upper piece. If you start looking from the upper piece, you will be expecting a dark blue-green piece to match the bottom lug, and this simply isn't there at all! Because the pieces in the picture are more or less exactly the same size as the ("real") pieces, the boundaries may line up, sometimes even more closely than here. 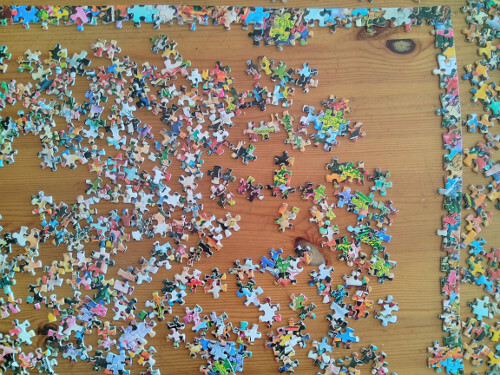 Technically the photograph in this puzzle is a bit of a disaster. You would have thought the art department would be given the job of making a nice pile of pieces, then reproducing it "flat" – with the axis of the lens perpendicular to the subject, and appropriate lens and aperture to make it crisply in focus everywhere. (Just as if you put the pieces upside down on a photocopier.) 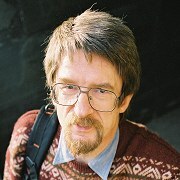 But this looks rather as if someone said "No need for anything technical; my phone's got eight squillion pixels..." The result is that very little of the image is even in focus, and it was taken at an angle, with a wide-angle lens, so the bottom corners in particular are totally blurred. The counter argument would have to be that someone could see how hard the puzzle would be, and thought they would offer some clues. There are actually two ways in which it is easier: identifying the degree of blur tells you a lot about where the piece might go, and the viewing angle means that for almost any piece, you can immediately see which way up it goes. The latter is extremely unusual: for most "hard bits", the sky for example, you can at least look at the paper grain on the back of the piece to see if it is vertical or horizontal, but when trying a piece you automatically check whether it might go in upside down. I found myself having to consciously avoid wasting time doing this! Sort the pieces into four sets: edge pieces, really badly out of focus pieces, just rather fuzzy pieces, and moderately sharp pieces. Start with the edge pieces; then the really fuzzy ones will fill in from the corners. As the pieces get sharper they will be closer to the middle. Try working on one colour at a time, just trying to get pieces joined together. Also sort out all of the "nonstandard" shaped pieces: those that do not have one pair of opposite sides both "out", and the other pair "in". These should fit together in clumps. You will need lots of space to keep the groups of connected pieces, and it hardly needs saying that you will need enormous reserves of patience. Good luck! ... photo of completed puzzle follows shortly - once I have it framed! Browse the complete list of artists. How to display puzzles on the wall without needing to buy a frame: Murals! Despite the FAQ, we can supply frames by special order: more information. Any other problems or just questions - please ask! 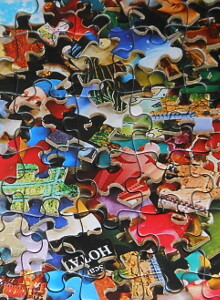 The details under each puzzle show the price, with approximate equivalents in US dollars, euros, and pounds sterling. Click "Buy this puzzle" to go straight to the checkout with a single puzzle, or "Add to basket" to carry on shopping. At the checkout, you can select the shipping method, then choose how you are going to buy the puzzle(s). If you have any questions or problems, just use the forms provided to ask, and we'll get back to you. 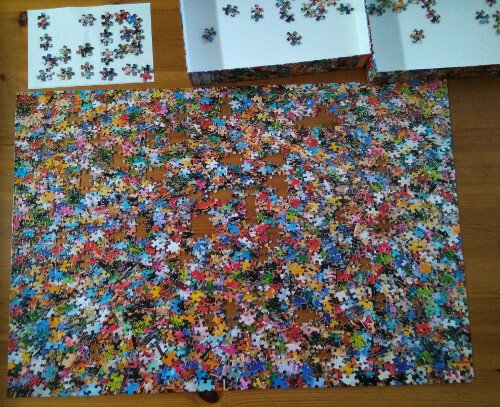 Once we receive confirmation of a payment, we aim to despatch puzzles by the next working day. You do not need to create a PayPal account in order to make a payment; the total is in yen, but you will be charged in your 'home currency', and you will be able to check the final amount before confirming payment. and bank transfer in many countries. The Shop is only part of my website, the Imaginatorium - I hope you will have time to explore some of the other pages!